WILKES-BARRE, Pa. — The Wilkes University Colonels beat the Penn State-Behrend Lions 77-62. The Colonels came in looking for their first win since they beat King’s College 101-72 on Feb. 13. The Colonels came into this game the underdogs as the Lions were the top seed in the pod, with Wilkes the No. 2 seed. Penn State-Behrend defeated Alfred University to earn their spot into the quarterfinals, while Wilkes had a bye since the tournament is hosted by Wilkes. The game started with the Lions showing their size advantage with Dan Wanker (19 points) dominating the game inside. The first half was very close though as the Colonels were able to make eight three-point shots to keep themselves in the game. The Colonels went on a late run in the first half to grab the lead 33-29 at halftime. Wilkes came out firing in the second half as they found a defensive group and scheme that worked. The Colonels slowed the Lions down and they started to create some separation on the scoreboard. With some momentum changing plays on the defensive side of the ball and back-to-back threes made by freshman Jack Bova (14 points). The Colonels went on to completely take control of the game as they took a game high twenty-one point lead which the Lions failed to cut below double-digits. 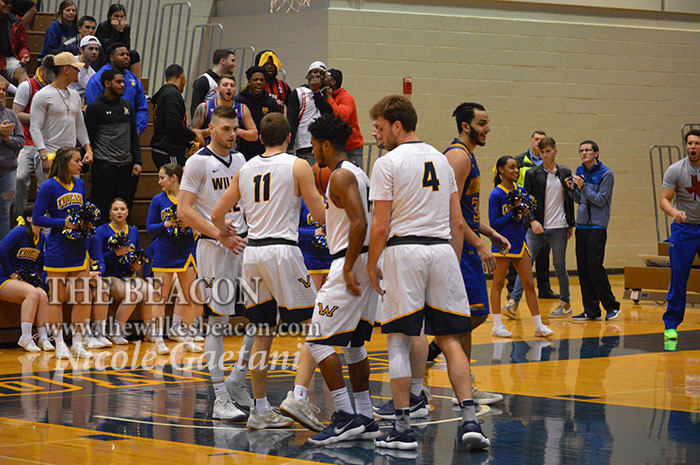 Wilkes went on to cruise to their fifteen point win over Penn State-Behrend. With the win, the Colonels move on to the ECAC semifinals where they play the Widener Pride, who advanced to the semifinals after beating top seeded Wilson College Wednesday, and a win by forfeit over Baruch College. The semifinals will be held Saturday with Neumann and University and Medaille College playing at 3:00 p.m. Wilkes and Widener play after at 6:00 p.m.